Actually, the underarm and back fat are considered as the most challenging parts of the body to burn fat. The extra fat triggers mental distress in many people. Fortunately, there is a way to effectively get rid of the excess underarm and back fat. By having a balanced diet and doing specific exercises you will be able to eliminate the extra fat and tone your muscles. However, it is very important to know that you should make a real effort so you can achieve your goals and get the desired results. These exercises target all the muscles in the upper body. 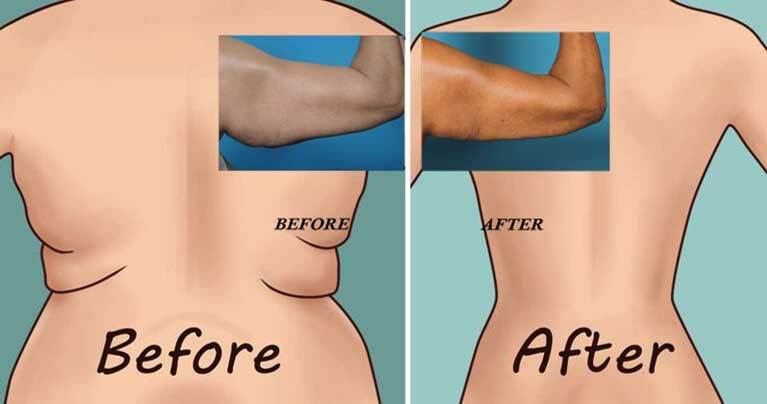 You should perform them for a few weeks in order to get rid of the underarm and back fat and tone your arms and back. What is more, you will not need any equipment to do these exercises. Even though this exercise is very simple and easy, it can effectively strengthen your muscles and improve your posture. This exercise will strengthen all of your back muscles including upper back and lower back muscles. T: Lie on the floor with the face down. Extend your arms and form the letter “T” with your palms turned toward the ground. Then, lift them and make sure to squeeze your shoulder blades. Hold this position for 7 seconds then return back to the beginning position. Do 2 sets of 20 repetitions. Y: Lie on the floor with your face down. You should move the arms into a Y position. Slowly lift your arms and squeeze your should blades together. While doing the exercise, make sure to keep your arms straight. Then, return back to the beginning position. Do 2 sets of 20 repetitions. I: You should remain in the lying position and extend your arms above the head. Move your arms into a position of I then lift your arms straight up while squeezing your shoulder blades and pushing them in a direction to your lower back. Do 2 sets of 20 repetitions. This powerful exercise effectively targets all small spots in your upper back. Lie on the floor with your face down with your arms at side. Gradually lift your head and chest off the ground. Make sure that the back part of your hands is facing the ceiling. Also, make sure to squeeze between your shoulder blades. Do 3 sets of 15 repetitions. Lie on the floor with your face down. Extend your arms to the sides with your palms facing down. Lift your arms above the head while keeping the head down. Also, keep your back straight and your feet a few inches from the wall. Then, you should lower the arms back to the sides, making sure to keep them straight. Perform 3 sets of 10 repetitions. This exercise targets the inner back muscles. Lie on the floor with your face down. Stretch your arms over the head and gradually lift your arms, legs, and chest off the ground. Do 3 sets of 10 repetitions. This exercise will significantly improve your body posture and strengthen all of your back muscles. It is very easy and simple to perform, and will effectively eliminate the back fat. Get down on your feet and forearms with your legs wide apart. Make sure not to move your hips while lowering your chest down. Squeeze your shoulder blades together and hold for at least 10 seconds. Do 2 sets of 20 repetitions. This is a classic core exercise which can elevate core strength in your abs and back. It will enhance your balance, stability and blood flow and tone your back, arm, and shoulder muscles. You should start on all fours with your knees under the hips and your hands underneath your shoulders. Keep your back straight. Extend your left arm and your right leg and hold this position for a few seconds. Switch sides and repeat the same procedure. The best thing about these exercises is that you will not need to visit a gym. You can perform the exercises at your own home. Perform them regularly and after a few weeks, you will notice significant improvements. You will be confident and you will be able to wear your favorite sleeveless dress again.